The use of electric field stimulation to elicit a desired cell/tissue response has become a versatile strategy in regenerative medicine. Using an array of cell types and biomaterial substrates, our group has experimentally investigated the influence of external electric field parameters on the modulation of cellular functionality in vitro. However, the mechanism of action of electric field is not clearly understood, especially in cases where cell fate processes such as differentiation and proliferation are significantly enhanced due to electric field stimulation. In order to understand these important phenomena, it is necessary to first examine the response on a single cell. In this direction, we analyze the response of an electrical analogue of a single biological cell, wherein an electrical equivalent resistor-capacitor (R-C) network has been constructed by considering membranes as capacitive and surrounding biological media (cytoplasm and nucleoplasm) as resistive components. The response of this electrical analogue of a biological cell to external electric field (E-field) is determined using analytical techniques and SPICE-based simulations. The solutions for the network provide a time constant of ≈ 30 μs, which is higher compared to the case when membranes were considered to be purely capacitive. The above model formulation has been further extended to determine the steady-state current response under various input signals, like sinusoidal, square, and triangular pulses using SPICE simulation package. 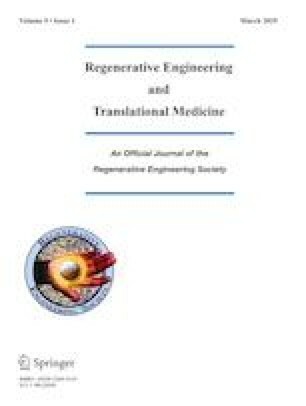 In the context of regenerative engineering, the results of the present work are perceived to be important to design electric field-based stimulation strategies to obtain desired responses of electroactive tissues. The importance of the effect of electric field on cells and tissues has become evident over the last two decades. Prior studies indicate that based on the electric field parameters, it is possible to get various cellular responses. The current study is an attempt to investigate why this is the case by approximating a single cell into an equivalent electrical network with resistors and capacitors. The network response is studied using simulation tools to get current waveforms and analytical techniques to obtain time constants, which provide vital insights into the observed cell behaviors reported in the literature. The present analysis is limited to a single cell, but cell biology experiments in general are carried out on cell populations. Hence, a natural continuation of this work will be to apply similar analytical techniques and simulation tools to study how a group of cells respond to electrical stimulus. We would like to thank SERB, Department of Science and Technology (DST), Government of India, and National Network for Mathematical and Computational Biology (NNMCB) for their support in carrying out this work.